Samael is dead, but a storm is still raging across Vigil. Ascension: Storm of Souls takes players into the chaos following the Fallen One's demise. As Samael's monsters run wild and his minions conspire, the world is being slowly overtaken with souls that should have moved on. Are you ready for the new challenges that Vigil's future holds? 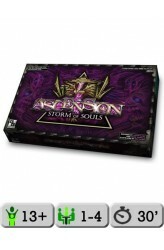 Ascension: Storm of Souls is the first full-sized expansion for the hit deck-building game from Gary Games. The 200-card set features tons of new cards and mechanisms, in addition to a new Event card type. This is a complete game for 1-4 players that's playable on its own or in combination with other Ascension games. Combine this with other Ascension games to play with up to six players! Integrates with Ascension: Chronicle of the Gods..